Tyrone Young Farmers’ Club had a busy, fun-filled and successful weekend at Omagh Show. The day kicked off with all members from Tyrone YFC doing their bit by manning the stand and promoting YFC. The main attraction to the stand was Miss Tyrone’s (Kerry Rea) Pygmy Goat and kids where everyone had the opportunity to guess the name of the kids for a spot prize of £20. On display at the stand were the photographic competition, poster competition and the hostess competition. The topic for the photographic competition was ‘Summer’. Isobel O’Brien kindly judged the photographs. The theme for the poster competition was ‘Embracing Change’ which is this year’s YFCU theme chosen by James Speers, the president of YFCU. The hostess competition was won by Elaine Wilson who is from Derg Valley YFC. The theme was particularly relevant following the recent royal wedding and it was called ‘A Royal Feast’. On display in the home industries tent was also the YFC floral art competition which is becoming increasingly popular and the results proves that floral art is not just for girls following James Hawkes from Seskinore YFC gaining first place in the junior section. The theme for the junior section was ‘A Dinner Party’. In the senior class the theme was ‘A Basket Full of Love’. Third, Emma Gibson - Trillick YFC. Miss Tyrone (Kerry Rea) who is from Cappagh YFC also had her duties to uphold which involved presenting the Excelsior Perpetual Cup on behalf of Fane Valley Feeds to William Hunter, Castlederg, who was the owner of the champion dairy cow. Miss Tyrone was looking very glamorous on the cattle lawn even when she was pulling tug of war for her club. Adam Hawkes from Seskinore YFC was stewarding the poultry and this was ideal as he represented his club in presenting their poultry shield to the champion. Last by no means least, the tug of war concluded the day perfectly for Tyrone YFC and all the spectators who came to support the clubs who were taking part. The tug of war event was a huge spectacle thanks to the good weather. Derg Valley YFC, who have been advanced tug of war champions at Balmoral Show two years running narrowly came out on top of Newtownstewart YFC who were runners up of the competition. 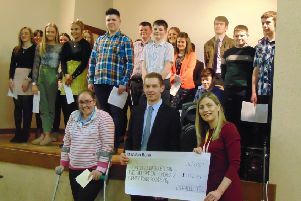 Miss Tyrone presented Derg Valley YFC with their £300 prize money which was kindly sponsored by the Omagh Show. A huge thank you must go out to everyone who was involved in helping at the YFC stand, those who entered the competitions, members of the public who came to visit Tyrone YFC at the stand and also support the tug of war and of course the Omagh Show for the kind sponsorship of prize money for the tug of war.